Jesus said ‘man shall not live by bread alone’. Still, as my observations chew mostly on ‘non bread’ matters, I thought I’d put in a good word for food today. I grow and harvest kale all year around here in California. As far as I know, this is the most nutritious veggie on the planet. Of course, kale just boiled and served soon gets old. Chinese stir-fry is better. Then there are kale chips: chopped kale, chili, soy, tahini, lemon, garlic. Juicing kale is my favorite. Adding lemon juice or citric acid turns it into a delicious ‘kale fruit juice’. Examine the nutrient chart here to see just how perfect kale is. RDA is the USDA’s ‘recommended daily amount’. If you only ate kale, you’d have to eat 8 pounds of it to give you the 2000 calories you need daily. But just look at the incredible surplus of essential minerals and vitamins you’d get. Even if you only ate a fraction of that 8lbs. you’d do far better nutrition wise than before. Kale is extremely cold hardy, which made it a staple for Siberian serfs; they needed all the nutritional help they could get! Kale is also remarkably insect and disease resistant. So, if you have a plot of dirt handy, do your biology a favor and plant kale. It is easy to grow, and if you let some go to seed, little kale sprouts will pop up here, there and everywhere. To optimize this, all you need do is pluck the seedlings out and replant them with enough space between each plant. Well, that’s all from farmer Carl (Carl actually means ‘farmer’ in Swedish as I recall… or was it ‘strong man’? Maybe it was strong farmer man. Thanks kale!). Calories (c.) 2000 c. 50 c. 2000 c.
Cut off heel end from 6-8 bulbs of fresh garlic, break into cloves. Chopped ginger and garlic cloves. Add the sauce (contents of Cuisinart) to chopped kale. Place in a solar dryer in an inch thick layer (or other means of drying) for a day or more (depending on your climate) until crisp . Note: sunlight shouldn’t shine on the chips themselves. If kale chips absorb moisture (i.e., in winter), use silica gel to remove moisture, and/or place in oven (not turned on… only pilot light on) for a day or so. I keep a few silica gel canisters with the kale in winter and ‘recharge’ the silica gel in the oven a few times during winter. Kale is lovely in soup, and cooked and chopped it makes a great addition to a fritatta. If you destem it and cut it into slender ribbons, then knead it, raw, with lots of good olive oil and some salt, it makes a wonderful salad ingredient. It breaks down a bit and becomes succulent, meaty and delicious. Great with broccoli raab, grated carrot and avocado chunks plus your favorite olive-oil or tahini-based salad dressing. Look closely and you’ll see how much more nutritious kale is over pac choy, except for fola (folic acid) where pac choy beat kale hands down. The moral of this is the importance of some variety. Each food has its strong points. It is just that kale has so many strong points! By the way, I left the RDA column amount in as a reference, but the comparison is just between 3.5oz (100g.) of kale and pac choy. It should be said too that pac choy is a mighty healthy vegi. It just looks weak when judged against kale. Now, speaking of availability in the market. I happened to see kale at the market last year and was blown away by the price. As I recall they charged close to $5 a bunch (about a plant). 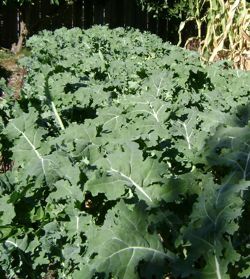 It is easy to be a rich person if you measure wealth in how much kale you can grow. It is the easiest and most prolific. So why do they charge so much? I suppose it is just a case of supply and demand. Little demand makes for little supply which increases the price for those rare persons who buy kale. Interesting. I’m sold. I don’t think it’s always available at the market so I guess it’s best to grow it yourself. I’ve always heard that bok choy is the most nutritious vegetable…maybe I’ll try to find a comparison.